Artists like Danny Green are exactly the reason I told a fairly large publication that I contributed to for a brief time and a larger independent label to take a hike…Green’s sophomore release will drop on October 16th. A Thousand Ways Home finds Green working in a most unique setting by merging jazz, classical, Brazilian and Latin into a most personal hybrid of expression that no other pianist dare take on. Green is taking an artistic road less traveled in the attempt to find and embrace his own lyrical presence at the piano bench and A Thousand Ways Home should indeed turn some heads. Green’s material here is all original and he handles the arrangement with skills and a welcoming melodic presence. There is an overwhelming feeling of joy that exudes from this recording. Joy is the essence of making music, lose that and you might as well sell cars for a living. Same goes for critics as well, a previous editor once informed me I was too passionate about music. I needed to remain detached with a more obtuse bent to my writing. Seriously? If Danny Green felt the same way we would not be talking about this stellar release we have been blessed with. Green’s joy of playing, arranging and composing place him in that rare jazz triple threat category and he is clearly excitied about doing his job! 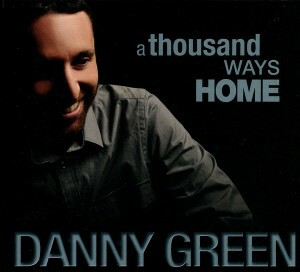 Opening with “A Thousand Ways Home” there is a dynamic sense of lyrical purpose. A percussive flair couples with a nice counterpoint from saxophonist Tripp Sprague. An infectious energy coupled with the ability to shift harmonics on the fly as the various genres previously mentioned are incorporated without stripping one’s musical gears. Julien Cantelm owns the pocket on drums and adds a great deal of finesse and subtle nuances necessary to aid in the obvious transitions required here. Justine Grinnell is a lyrical bassist beyond reproach and rounds out a rock solid rhythm section. “Quintal da Solidao” is kicked off with Brazilian vocalist Claudia Villela and part of my passion does include Brazilian music that makes my musical back leg shake and this tune fills the bill nicely. Green’s punctuated articulation is the perfect accompaniment and is the rhythmic conductor driving this train. A soloist with a deft hand and keen ear shows Green at his very best. Joined by legendary Brazilian guitarist Chico Pinehiro this tune develops its own organic melodic pulse, the musicians are simply the conduit from which the energy travels. “Dusty Road – Part 1” has a deceptively subtle classical influence while maintaining a more contemporary cinematic approach. As a solo piano work or perhaps “Interlude” this snippet may showcase Green’s lyrical talent best. “Dusty Road – Part 2” includes guitarist Dusty Brough with an amazing yet ever so subtle samba beat that borders on the addictive. In most cases when a leader and especially a pianist attempts to pull off what is essentially a hybrid release that turns into nothing more than a futile if not self indulgent attempt at showcases the technical while leaving the artistic soul idling in the car, A Thousand Ways Home is a different kind of release. Combine the technically proficient with the artistically gift and then toss in the appreciation and celebration of those musicians closes to him and you have passion on a nice shiny disc. This is why I write about music in general and jazz in particular.